The Mycia is a hand-made, wooden, gaff-rigged, American sailing-fishing schooner, approximately 73 feet from bowsprit to stern with a 16 foot beam and 9.5 foot draft. Built entirely by hand in the Pacific Northwest, the Mycia was designed and lofted in Port Townsend, Washington, by Jim Franken and Robert Prothero at the Northwest School of Wooden Boat Building in 1981. The Mycia was designed from traditional east coast sailing/fishing schooners and built for the commercial halibut and blackcod fisheries in the Gulf of Alaska. Assembly began in the Maher Family's backyard after ten years of stockpiling materials. The Maher Family launched the Mycia in 1997. She entered the water and embarked on her maiden voyage north along the Inside Passage to Alaska without masts, sails or rigging. Now completely outfitted with full sails, the Mycia is the accomplishment of a lifelong dream realized through the hard work and vision of a family effort. The Mycia is nicely designed for individual, group, and family adventures. Her traditional outfitting mixed with modern amenities makes cruising aboard the Schooner Mycia a unique experience for sailors of all ages. From our base in Port Townsend, Washington, routes include the San Juan Islands, the Inside Passage, British Columbia, and Southeast Alaska. Adventures and excursions in the Pacific Northwest and Alaska are offered by exclusive arrangement with Captain John Maher and Captain Darcey Maher. Captain John Maher was born on the shores of Lake Erie in Cleveland, Ohio and fished for pike, perch, and bass with his father and brothers on several wooden skiffs while learning to sail in his late teens. After graduating from Bowling Green State University, John moved to Oregon to pursue his education in marine biology at Oregon State University and began sailing and fishing his way to Alaska in 1979. Commercial fishing for halibut and sablefish inspired a search for historical fishing and sailing vessels. With his brother, Richard, as partner and his wife, Melinda, as best mate, they fished from a variety of wooden fishing vessels, including the well-known schooner King and Wing. Annual transits from the Puget Sound to Southeast Alaska since 1980 have yet to reveal all the wonders of the Inside Passage. Melinda Trenary was born and raised in Oregon. She grew up on the rivers, fishing with her aunts and uncles during the summer. 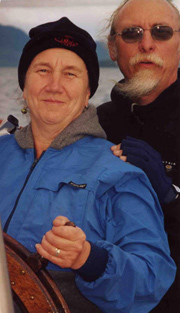 In 1979, she met her husband (Captain John Maher) and started her many trips up and down the Inside Passage between Port Townsend, Washington and Southeast Alaska with their six daughters and crew members on their commercial fishing boat. She has spent many years cooking delicious, wholesome, gourmet meals with every kind of seafood caught on their boat. Melinda also has first hand cultural knowledge to share about native coastal life and enjoys teaching beading and weaving on weekend or longer cruises on the Mycia. Captain Darcey Maher is a licensed United States Coast Guard 100 ton Master who has lived on and around boats her entire life. Her family's 54-foot commercial fishing boat was home and school for much of her youth. In addition to fishing with her parents and sailing around the Pacific Northwest on the Mycia, Darcey's eclectic marine resume includes crewing for a 90-foot luxury yacht, an international ferry, and a whale-watching boat. She also spent summers as captain of a longboat working with at-risk youth while sailing and rowing around the San Juan Islands. Darcey received her BA in Environmental Studies and Journalism from Western Washington University in Bellingham. Learn about our custom sailing adventures, see our photo gallery, signup for our Mailing List, or Contact Us for more information about sailing the Schooner Mycia in the Pacific Northwest and Alaska.